It's over and school will soon be in session. Both the teachers' union and Seattle's school district confirmed that school will be open Thursday as the nearly week-long teachers' strike comes to an end. 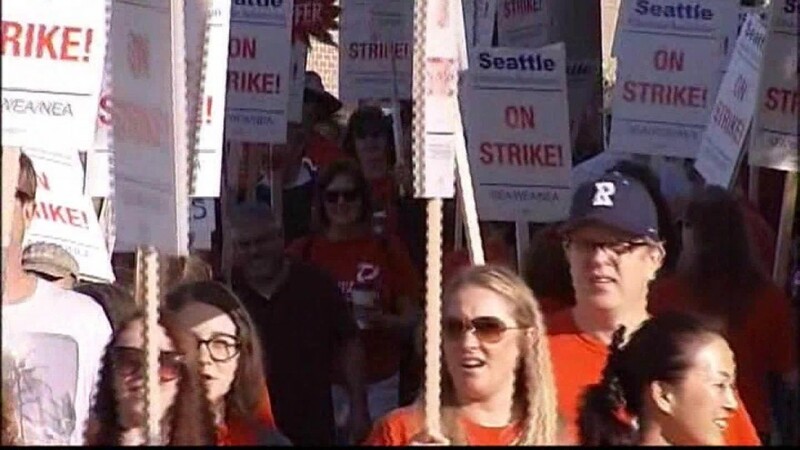 The union, the Seattle Education Association, said it would recommend approval of the tentative contract agreement, which came Tuesday after overnight negotiations with the district. The SEA said the tentative agreement addressed "every one of the priority issues identified by SEA members last spring." In a Facebook post, the SEA listed some of the issues and how they'd been resolved. Details of the agreement could also be found on the Seattle Public Schools website. Through the negotiations, 30 minutes of recess is guaranteed every day for elementary students, and new policies will be adopted to minimize over-testing. Teachers will receive base salary increases of 14% over the next three years, which includes a cost-of-living increase of 4.8%. In addition, teacher evaluations will no longer be linked to test scores and teachers will be compensated for a longer work day. The union also succeeded in ensuring that 30 of the district's schools would create "race and equity" teams to combat the opportunity gap and eliminate racial inequity among students. Teachers will return to work Wednesday to prepare for school and will vote on the agreement Sunday. More than 5,000 teachers participated in the strike, which was the nation's largest since Chicago's massive strike in 2012. Despite the school closures, the strike received strong support from parents of the district's more than 52,000 students.